can anyone recommend a case for the camera. Its kind of an odd size and nothing I have works. Ive been looking at the pelican range..I think the 1510 is what Dan suggests in the equipment section here. With some foam they seem to work well. 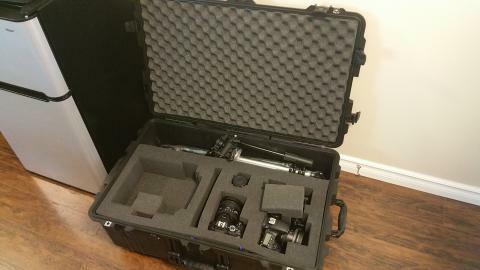 I currently use a Pelican 1520, it has more then enough room. I bought the one with pluck the square foam pieces and it looks factory made. I found a wonderful Shimano case designed to carry 8 fishing reels. It looks like a soft sided cooler and the foam packaging from the original case fits perfectly. Ample space on the side for chargers and my Cannon for stills. Aside from the tripod, it looks like nothing important siting in the back of my car when I have to make other stops (I usually coverup the tripod). Check out sporting good stores for unique cases that might work. That is where I had the best luck. This case was originally $100 or so and it was on clearance for $30. Welcome to the Matterport User Group Forum. Here's my shopping list of Matterport Gear and Accessories. I ordered the Krispy Kreme's off your list and three of them came with bite's out of them. I had a Pelican 1550 that I hadn't been using, that turned out to be the perfect size. I removed enough pick 'n' pluck foam to accommodate the foam that the camera came in. I skewed it to one side so that there would also be room for the charger. Very convenient. I use a Pelican 1650. A little overkill just for the matterport, but if you have additional camera equipment and a few tripods it works well. Has rollers as well. I also have a smaller one just for matterport only jobs. Think its a 1510. I use a Nanuk case which is made in Canada. It's very similar to the Pelican case I was issued but I actually like it better than the pelican. I like their latches and minor features not present in the Pelican I use such as the handle snaps in the down position keeping it from potentially being broken (Not likely with these cases, but possible). The resin is supposedly stronger allowing a lighter case, but I have no way of verifying that. The price is better as well.